Haiti president Michel Martelly wants to sit down a talk with the people of Arcahaie who are really angry over his decision to take part of the city, especially the beaches, to carve the new commune of "Les Arcadins." 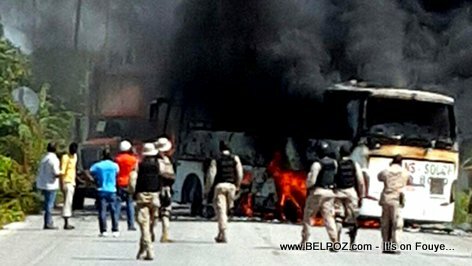 Tension rose high in the Haitian flag city of Arcahaie following the creation of the new commune, protests became violent, motorcycles were burned, even a transport bus from company Sans-Souci was burned to the ground. A specific date has not been released as to when these talks will take place but President Martelly said he wants to find a peaceful solution to this crisis. why president mately nerve think about that before. after the killing and burning its time for him to talk..very stupid none since. poukisa li pat Panse konsa avan toute bagay rive konsa.